Do you want to be able to analyze your Facebook Page and understand what is working and not working? Are you frustrated with the poor organic reach of your Facebook posts or lack of user interaction and want to make improvements? Facebook Insights provides you with all the key data you need to optimize your page’s performance. This guide will show you the value of Facebook Insights and hopefully encourage you to use it more. Facebook Insights is a free analytics tool provided by Facebook to help you understand more about your Page’s posts and fans. Which posts are getting engagement (likes, comments, and shares), and which ones are not getting your fans’ attention. Is your Fan page count growing, and how quickly? How much of your audience sees your content? 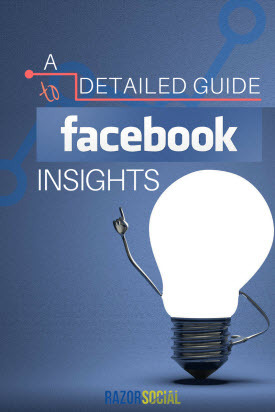 This guide will help you understand Facebook Insights, but to get the most out of this tool you’ll need to use it on a regular basis and stay in the loop with new developments on your page. Go to your Facebook Page and select the ‘Insights’ option at the top of the page. When you access this tab, you will see that the insights are broken down into fifteen tabs. Depending on your goals, you’ll find some of the available options more useful than others. Let’s go through each tab and explain what they do. This tab gives you a high-level overview of the performance of your Page for the selected period (last 7 or 28 days). Actions on Page shows you the number of clicks on the contact info or a call-to-action button on your Facebook page. Next, you can see how many people viewed and liked your page. You’ll also see how many people in total saw any of your posts (Reach) and how many people engaged with your posts with likes, comments, and shares. If you’re posting videos on your Facebook page, here you’ll be able to see the number of times videos on your page have been viewed. Below the page overview, you’ll see how well five of your most recent posts performed in terms of reach and engagement. This tab will be very useful to you if you decide to give your Facebook posts an additional boost by promoting them to target audiences beyond your Page’s fans. From here, you’ll be able to Boost a Post or create an ad to include a CTA button on your page. When you click on a Boost a Post option, Insights will show you a list of Recommended Posts or your best performing posts. These are the posts that have more user engagement than other posts on your Page. When you select a Post that you want to promote, you’ll be able to specify the audience you want to target and choose a budget and duration of the promotion. Here you’ll see your Facebook Page’s total number of followers as well as Net Followers. The latter is useful because it shows you the number of new followers minus the number of unfollows in the last 7 or 28 days. 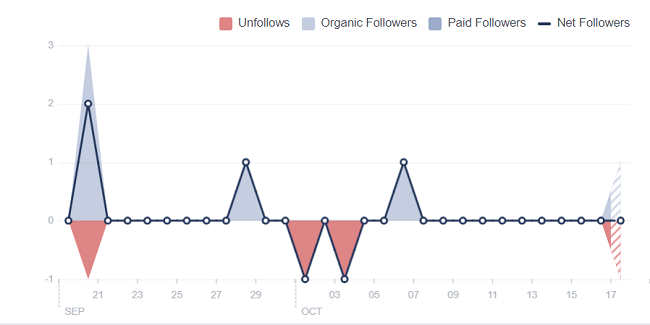 This helps you understand how your page is performing over time in terms of acquiring/losing followers. This tab will show you your Facebook Page status in relation to the fans on your page. Total Page Likes – View the growth or decline of your ‘likes’ on a daily basis. Net Likes – This shows you the likes that were organic (unpaid) and those that were paid through Facebook ads. You’ll also see if anyone has ‘unliked’ your Page. There’s nothing wrong with getting some ‘unlikes’, as long as it’s a very small percentage of your total audience. Where Your Page Likes Happen – The majority of likes will probably happen when people visit your Facebook Page but they could happen in other places. Use this section to analyze when you get most and/or least likes. Was it because of a promotion, content you shared, or something else? Post Reach – This section shows you the number of unique people who saw your posts on Facebook over a selected period of time and it includes both organic and paid reach. If you click on any section of the graph, Facebook Insights will show you details of the posts that created the displayed reach. Check out the peaks and the lows. Why did you get those peaks and why certain posts didn’t work among your audience at all? Reactions, Comments, and Shares – View the trends related to reactions, comments, and shares on your posts. Click on any point in the graph and view the posts related to those trends. Hide, Report as Spam and Unlikes – Unlikes are OK as long as it’s only a very small percentage of your total fan count. However, people marking your content as spam is something you really need to watch. This is not a big issue if it happens rarely, but if it’s happening regularly, Facebook may penalize you for it. Total Reach – This section shows you your posts’ reach, plus any content that was posted to your Page and shown to your fans, Page-like ads, mentions, and check-ins. 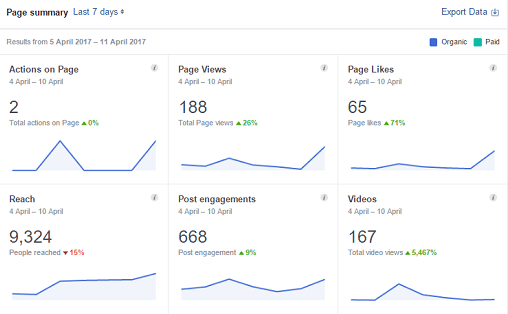 Page and Section Views – This shows you the number of times your Facebook Page – and any tabs on your page – are visited. Typically, fans don’t revisit your page once they become a fan. You are relying on them seeing the information in their news feed. Total People Who Viewed – Here you’ll be able to see your page viewers broken down by age and gender, country, city and device (mobile and desktop). Page previews happen when a person hovers over a link to your Facebook page. People can preview your page in a number of places, including hovering over your page when it’s tagged in post descriptions or hovering over your page when linked to in a profile’s About section. Previews are important because they could (and should) result in someone linking your page. That’s why you should keep tabs on the stats related to previews! Page Previews section of the Facebook Insights will show you total page previews over a selected period of time, as well as the total number of people who previewed which you can then view broken down by age and gender. How many people clicked on your website link. When Your Fans Are Online – This shows you how many of your fans are online at any given time during the day. In the graph below, most of our fans are on Facebook later in the afternoon, which makes sense as a lot of our fans are based in the US and we’re at least 5 hours ahead of them. It’s not always best to post when most of your fans are online, because that may also be the most competitive time to get onto their newsfeed. You also may have fans in different parts of the world, so you will need to target them with content at different times. Post Types – View a list of the posts you shared on your Page by type. You can see which posts worked the best – photos, links or status updates. You should always have a variety of different updates on your page, so try to have a good mix. Top Posts From Pages You Watch – This will show you the most popular posts from Pages you track. It is really useful to see which posts work well for your competitors. If you organize Facebook events, the Events tab will provide you with useful data so you can optimize your event promotion accordingly. You can find out the number of people who saw your event, the number of people who responded to your event, how many of them clicked to buy event tickets, and your audience demographics. The Videos tab tells you how well videos are performing on your Page. It shows the number of video views, broken down into Organic vs Paid, Unique vs Repeat, and Auto-Played vs Clicked-to-Play. Video Views – The number of times your videos were viewed. Everything above 3 seconds is considered a view by Facebook’s criteria. 10-Second Views – The number of times your videos were viewed for 10 seconds or more. Top Videos – Here you’ll see the top five videos which have been viewed for three seconds or more. This can show you what type of videos perform well with your fans. If you really want to dive deep into your Facebook page analytics, you should turn on Stories Insights. This will enable you to see how your Page’s story is performing. Even when photos and videos disappear from your Page’s story, you’ll be able to see them in this section for two weeks. 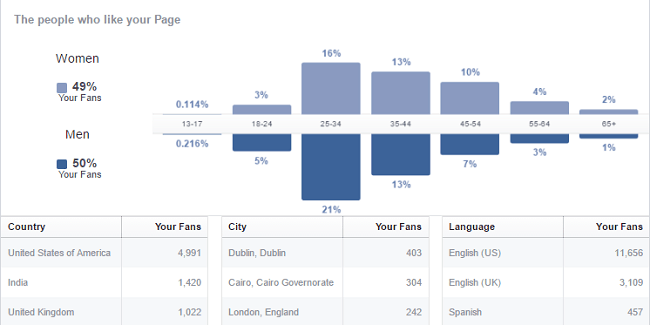 Your Fans – This shows you a breakdown of the demographics of your fans – male/female, country, city, age group, and language. Your followers – View a breakdown of people who follow your page based on gender, country, city, and language. People Reached – This shows you a breakdown of the people who saw your posts by country, city, and language. Analyze this to see if you are reaching the people you really want to target. If you’re running a local business, then this tab is incredibly important for you and you’ll need to request access to this functionality! Here you’ll get details about the people near your business, such as when the most people are nearby, their demographic profile, as well as if your ads reached people who are near your business. The Messages tab shows you the number of conversations you had with people on Messenger. It also displays your average response time, as well as the percentage of messages that you deleted, marked as spam, and blocked. You can export data on your Facebook Page into .xls (Excel), .csv (comma separated) files for further analysis. Page data – This gives you a daily breakdown, within a date range you specify, including new likes, unlikes, engagements, total reach, etc. Post data – This gives you a breakdown of key post metrics, e.g. reach, impressions, and feedback. Video data – A breakdown of daily views, unique views, organic and paid views. When you export this data, it’s in a format that enables you to produce your own, customized reports. You could create some Excel macros that automatically take this data and produce professional reports that could be used to present to your managers or customers. Jon Loomer provides a lot of great content on his site about Facebook analytics. There are many Facebook analytics tools available from other companies, but Facebook Insights is definitely a powerful tool that you shouldn’t ignore. It provides a ton of useful data that can help you improve the performance of your Facebook Page. Are you using Facebook Insights to improve your Facebook strategy? Share your thoughts in the comments bellow!